CMS Danskin Acoustics SuperLag Hygienic is a modern product consisting of three layers in the form of a single laminate. 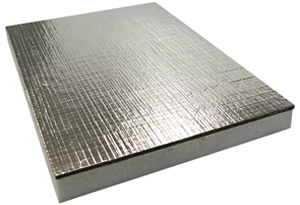 The acoustic isolating layer or spacer is a melamine foam. This isolating spacer supports a layer of heavy mass polymeric barrier and an outer Class ‘0’ flame/vapour barrier.